The World Cup has had the best viewing in the United States history. There is no doubt that soccer is emerging as a significant sport in the United States. The USA is slowly learning about off-sides rules, that ties are not as bad as we thought, and flopping is part of the game. Also, we have learned that the first approach to treating an injured soccer player is to drench the area with “magic spray." Many people have been asking what is in this magic spray that FIFA has been hiding from the world. After watching a few games on ESPN, one would think that this spray heals sprained ankles, knee injuries, and would probably cure cancer if they sprayed enough of it on a player. It is truly amazing how a player rolling around the grass in agony can sprint down the field seconds after being sprayed. So, what’s in this mysterious injury spray? Magic soccer spray is actually a topical skin coolant that typically contains ethyl chloride. 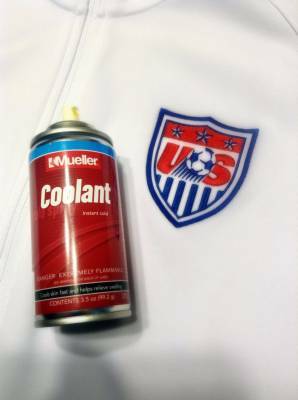 I recently purchased a can of Mueller Coolant Spray that contains Butane, Pentane, and L-Menthol. These aerosol cans cool and numb the skin temporarily; nothing is being healed or cured on the pitch. Skin coolants have actually been around since the mid-1800s. These coolants were originally used by doctors prior to giving patients a shot in order to reduce pain from inserting the needle. They have no effect on musculoskeletal injuries, especially since the skin is only cooled for a few seconds after being sprayed. When players magically get back on their feet after being sprayed, there is a high likelihood that the player was flopping. Although, some athletic trainers will argue that the spray has a psychological effect on the players and helps them return to play. American viewers need to know that the FIFA medical staff has not found a magical cure for all injuries. Whether the spray is being used to psychologically prepare a player to return to play or just emphasize the severity of the flopping act, the coolant spray is not fixing anything. We have a lot to learn about soccer as a country, but now, we know why your doctor isn’t spraying you during every office visit.